<b>Carrolls </b>Irish gift stores are very popular for tourists in Dublin, where they have 3 machines, and one in Cork. They now have one in the centre of Belfast. <br> They sell all manner of clothing and souvenir gift merchandise, including Guinness memorabilia.<p> There is a machine here from <b>ThePennyPress</b>.These machines are very efficient, but produce a simple design.<p> Each penny needs £1 and a penny piece. 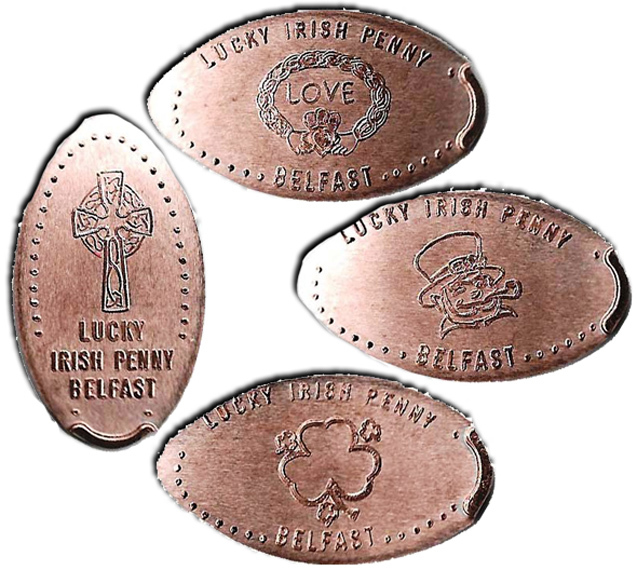 All pennies have Lucky Irish Penny Belfast Ireland in a dotted border. Machine details: <br> 1) ... Jaunty Irishman smoking pipe, <br> 2) ... Clover leaf, <br> 3) ... Celtic Cross, <br> 4) ... Claddagh Ring. Text LOVE inside <p> Aug. 22, 2018: machine in the middle of store to the left. Good working order. Carrolls Irish gift stores are very popular for tourists in Dublin, where they have 3 machines, and one in Cork. They now have one in the centre of Belfast. They sell all manner of clothing and souvenir gift merchandise, including Guinness memorabilia. There is a machine here from ThePennyPress.These machines are very efficient, but produce a simple design. Aug. 22, 2018: machine in the middle of store to the left. Good working order.